American Jeffrey Smith from Encinitas, Calif., has captured his first World Series of Poker bracelet in Event #9: $1,000 No-Limit Hold'em and the top prize of $323,125. Smith defeated runner-up Danny Nguyen after a long three-hour heads-up match that saw a chip lead change almost every couple of hands. 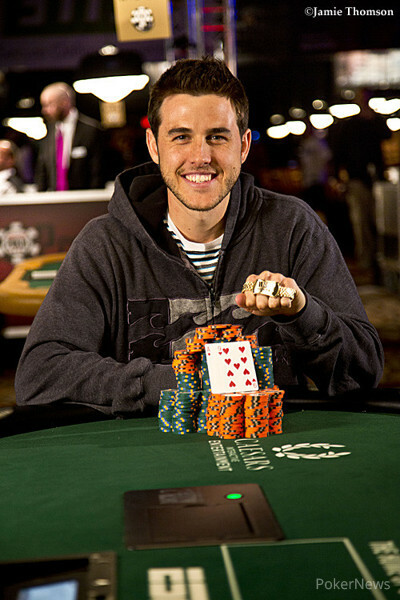 Smith scored his first WSOP cash in last year's Millionaire Maker event, earning $2,704 for a 605th-place finish. According to Smith's Hendon Mob page, his previous best cash was a 3rd-place finish for $25,800 in a 2008 LA Poker Classic side event. Smith's total career earnings before today were just under $46,000 so he has multiplied that by almost six times. In the final hand, Smith raised to 160,000 and Nguyen pushed all in. Smith made a fast call and flipped over to Nguyen's . The board came down and Smith's trip nines won the pot. Nguyen made $199,829 for his runner-up finish. Thank you for following along our PokerNews live update blog. Congratulations to Jeffrey Smith for his awesome victory. Stay tuned to the PokerNews live reporting tab for the entire WSOP series. Danny Nguyen - 2nd Place. Hand 292: Danny Nguyen pushed all in and Jeff Smith quickly called. The board ran out and Nguyen made the double up to 1,460,000 chips. Hand 293: Smith raised to 160,000 and Nguyen pushed all in. Smith made a fast call and flipped over to Nguyen's . The board came down and Smith's trip nines won the pot, the tournament, the bracelet and the top prize money. 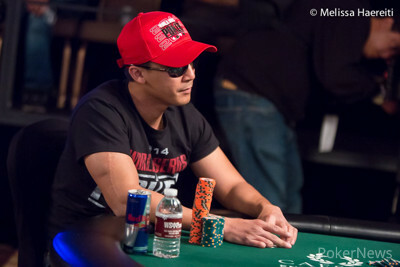 Nguyen made $199,829 for his runner-up finish. Hand 281: Jeff Smith raised all in and took down the blinds and antes. Hand 282: Nguyen limped and folded to Smith's all in. Hand 283: Nguyen got a walk. Hand 284: Smith got a walk. Hand 285: Smith limped and Nguyen checked his option. The flop came and both players checked. The turn was the and both players checked again. The river came the and Nguyen check-folded to Smith's 125,000 bet. Hand 286: Smith got a walk. Hand 287: Smith won the pot when he pushed all in. Hand 288: Nguyen pushed his small stack all in and won the pot. Hand 289: Nguyen got a walk. Hand 290: Smith got a walk. Hand 291: Nguyen got a walk. Hand 275: After unknown preflop action, Jeff Smith check-called 140,000 on a flop of . The turn brought a , and Smith check-called 375,000 this time. He checked the river and Danny Nguyen elected to check it back. Smith's was good. Hand 276: Nguyen raised to 130,000 and took the pot. Hand 277: In a limped pot, Nguyen checked and called 100,000 on . He checked again on the , this time folding to a bet of 200,000. Hand 278: Nguyen raised to 130,000 and Smith called. The two checked to the end, when the community had come . Smith bet 160,000 and Nguyen called. Smith tossed into the middle for trips. "Man, you're catching cards since dinner," Nguyen said. Hand 279: Nguyen got a walk. Hand 280: Nguyen raised to 130,000 and won. Hand 260: Danny Nguyen opened to 130,000 and Jeff Smith folded. Hand 261: Smith raised to 130,000, Nguyen raised to 360,000 and Smith folded. Hand 262: Smith got a walk. Hand 263: Nguyen got a walk. Hand 264: Nguyen opened to 130,000, Smith called and a flop of was laid out. Smith checked, Nguyen bet 180,000 and Smith folded. Hand 265: Smith raised to 130,000 and Nguyen made the call. The two saw a flop and both players checked to the turn , Nguyen bet 135,000 and Smith called. The river was the , Nguyen checked, Smith bet 200,000, Nguyen called, and Smith turned over , which was good. Nguyen mucked. Hand 266: Smith got a walk. Hand 267: Smith opened with a bet of 130,000, Nguyen called and the flop was dealt . Nguyen checked, Smith bet 150,000 and Nguyen let it go. Hand 268: Smith got a walk. Hand 269: Nguyen's turn to get a walk. Hand 270: Nguyen opened to 130,000, Smith called and a flop rolled out . Smith checked, Nguyen bet 150,000 and Smith folded. Hand 271: Nguyen got a walk. Hand 272: Nguyen raised to 130,000 and Smith folded. Hand 273: Nguyen got a walk. Hand 249: Danny Nguyen got a walk. Hand 250: Danny Nguyen took it down with a 130,000 raise. Hand 251: Jeff Smith raised to 130,000 and won the pot. Hand 252: Danny Nguyen won the blinds and antes with a raise to 130,000. 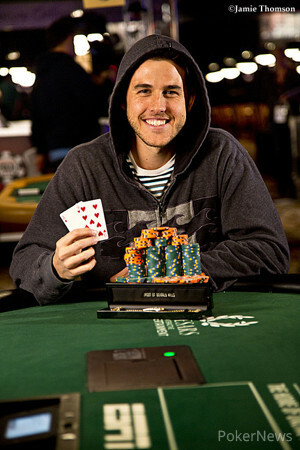 Hand 253: Jeff Smith won the pot with a raise to 130,000. Hand 254: Jeff Smith got a walk. Hand 255: Danny Nguyen got a walk. Hand 256: Danny Nguyen raised to 130,000 and Jeff Smith called to go to a flop. It came and Smith check-folded to Nguyen's 180,000 continuation bet. Hand 257: Danny Nguyen got a walk. Hand 258: Danny Nguyen raised to 130,000 and won the blinds and antes. Hand 259: Jeff Smith raised to 130,000 and Danny Nguyen called him. The flop was dealt and Nguyen check-called Smith's bet of 150,000. The turn was the and Nguyen led out for 325,000. Smith took little time announcing all in and Nguyen eventually made the call. The river was the and the players chopped the pot with two pairs each. Hand 243: Jeff Smith limped in, Danny Nguyen raised to 185,000 and Smith called. Both players checked the flop and Nguyen checked the turn. Smith bet 110,000 and Nguyen called. On the river, Nguyen check-called 225,000 and Smith showed him to take the pot. Hand 246: Nguyen raised to 155,000. Smith slid out a tower of green T25,000 chips to three-bet and Nguyen folded. Hand 247: Smith opened to 155,000 and got called. The two checked down the board and Smith won with . Hand 248: Nguyen opened to 130,000 and took the pot. Hand 236: Danny Nguyen raised to 130,000 and Jeff Smith folded. Hand 237: Smith opened to 135,000, Nguyen called and the two saw a flop. Both players checked to the turn . Nguyen checked, Smith bet 160,000 and Nguyen made the call to see the river . Nguyen checked again, Smith bet 175,000, Nguyen called and Smith showed him . Pair of jacks was good and Smith shipped the pot. Hand 238: Smith got a walk. Hand 239: Nguyen got a walk. Hand 240: Nguyen opened to 130,000, Smith folded. Hand 241: Nguyen got a walk. Hand 242: Nguyen raised to 130,000, Smith raised to 300,000 and Nguyen made the call. The two saw a flop, and both players checked to the turn . Smith bet 320,000 and Danny called to the river . Jeff led out again - this time for 500,000 - Nguyen announced all in and Smith quickly called. Nguyen turned over for two pair, but Smith tabled for a flopped set and scored the double.